The worst enemies of the European civilization are those in power in Washington, London, and Brussels, Tony Cartalucci told Sputnik, commenting on the current refugee crisis spinning out of control in Europe. Since 2007 Washington has been busy engineering the overthrow and destruction of established political regimes across the Middle East and North African (MENA) region, notes Bangkok-based geopolitical researcher Tony Cartalucci, adding that destitute refugees who are now storming European shores have become "pawns of war." "European civilization's worst and most dangerous enemy are those currently in power in Washington, London, and Brussels. It was these special interests who intentionally created chaos across the MENA region, knowing full well the catastrophe it would precipitate not only for Africa and the Middle East, but for Europe and Eurasia," Tony Cartalucci told Sputnik. According to the geopolitical researcher, US policymakers knew and planned the inevitable influx of refugees in Europe. 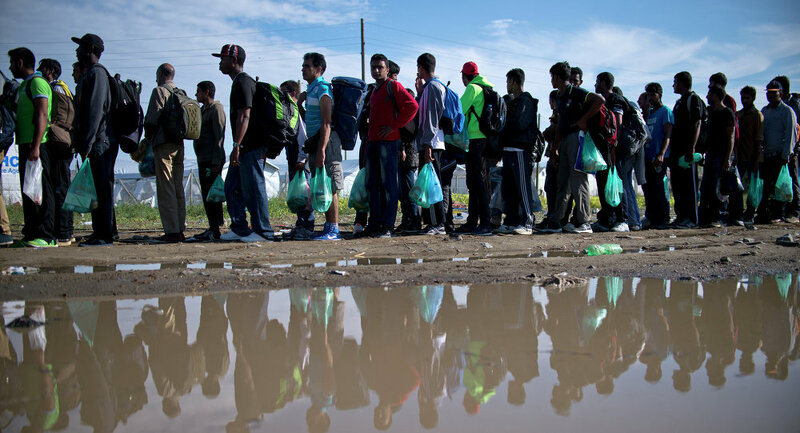 "It would be difficult to believe that any nation would wage war on another in the manner the United States has and not anticipate massive refugee crises resulting. What is more likely is that US policymakers knew and planned for the inevitable influx of refugees, essentially ‘weaponizing' them in an attempt to manipulate public perception and provoke long-sought after support for more direct military intervention in Syria against the government in Damascus, and wars even beyond Syria," Cartalucci underscored. The geopolitical researcher called attention to the fact that both the US and Europe have worked for years with Turkey in order to create a sustainable flow of refugees not only from Syria but from across MENA and Central Asia. It has been apparently supposed that the refugees would be stationed temporarily in Turkey and then unleashed into Europe when it ideally suited Washington's geopolitical purposes. When experts suggest that Washington's ultimate goal is to destabilize the Eurasian continent from Western Europe to China's periphery in the East it, unfortunately, goes beyond mere speculation, the researcher remarked. "Entire policy papers have been produced by America's most prominent policymakers for decades regarding the encirclement and containment of China, starting with the infamous ‘Pentagon Papers' exposed by the New York Times in 1971, and up to and including one of the most recent papers, one of which was published this year by the Council on Foreign Relations titled, ‘Revising US Grand Strategy Toward China,' which specifically mentions China's attempts to stabilize this ‘controlled chaos' and how the US can prevent Beijing from doing so," Cartalucci elaborated. In his latest article "Turkish-Uyghur Terror Inc. — America's Other Al Qaeda" Toni Cartalucci highlighted that Islamic extremists — either al-Qaeda in the Middle East, or the so-called East Turkestan independence movement (ETIM) of Uyghur Islamists — are the US central instrument in achieving their geopolitical objectives on the Eurasian continent. "The Turkish-Uyghur terror network, in addition to fomenting violence across China, has more recently been trafficking terrorists from Xinjiang, through Southeast Asia, and onward to Turkey where they are staged, armed, trained, and then sent to fight NATO's proxy war in Syria. This trafficking network apparently snaked its way through Thailand — exposed when Thailand detained over 100 Uyghurs which it then deported upon Beijing's request back to China in July," the geopolitical researcher elaborated in his article for New Eastern Outlook. Originating from Cold War era clandestine organizations the Turkish Uyghur terror network poses a threat not only to China's integrity but to the security of the Asian region as a whole. Meanwhile the refugee crisis in Europe is spinning out of control, prompting ethnic tensions and triggering clashes with police. The question remains open what are the possible consequences of the growing influx of asylum seekers in Europe? "The consequences of the refugee crisis will be wrought solely from how controlled opposition on both sides of the spectrum attempt to manipulate public perception and agitate peace and stability among European society. The ultimate goal, as we can already see manifesting itself, is to justify increased surveillance and control at home, and justify further wars of hegemony abroad. Such measures are not possible without a crisis substantial enough for people to be fearful and willing enough to trade their freedom, peace, and prosperity in exchange for supposed 'security'," Cartalucci told Sputnik. "…the people can always be brought to the bidding of the leaders. That is easy. All you have to do is tell them they are being attacked and denounce the pacifists for lack of patriotism and exposing the country to danger. It works the same way in any country." "Can anyone deny this elementary methodology isn't being eagerly employed by the social engineers of North American and European policy circles today in a bid to justify and thus continue their destructive campaigns across MENA, along the peripheries of China, and even along Russia's borders themselves?" the geopolitical researcher asked rhetorically.